The handwritten manuscript draft of New York State’s 1777 state constitution, adopted in Kingston on April 20, 1777, will be on public display on the 11th floor of the Cultural Education Center, 222 Madison Avenue, Albany, from Monday, April 15 through Saturday, April 20 from 9:30 am to 4:30 pm. The display marks the 242nd anniversary of the state constitution and the establishment of New York as a state. The handwritten draft contains numerous strikeouts, additions and corrections. The complete, official text was published as the Constitution of the State of New York by Samuel Loudon, State Printer, at Fishkill in 1777. A final copy of the 1777 New York State Constitution does not exist; it is possible that the complete document was destroyed after it was sent to the printer in Fishkill. A digital scan of the handwritten draft held by the New York State Archives is available online at the State Archives website. The first New York State Constitution was written and approved by a group of 14 delegates elected by property holders called the Convention of Representatives of the State of New York. While it was important to the delegates that the constitution represented the will of the people, the first constitution did not go to the people for a vote due to the ongoing Revolutionary War. By writing a constitution, the representatives were creating a government and a political system that did not exist in New York before the document was written. Following the adoption of the state constitution, the first elections were held in June 1777 and the elected officials took office in September of that year. George Clinton was elected the first governor, John Jay was appointed the first chief justice of the New York State Supreme Court, and Robert R. Livingston was appointed the chancellor. The New York State Archives is a program of the State Education Department’s Office of Cultural Education. 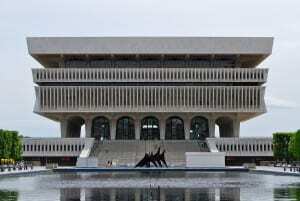 Established in 1971, the New York State Archives preserves and makes accessible over 250 million records of New York’s State and colonial governments dating from 1630 to the present. Further information can be obtained by visiting the State Archives website. Photo of NYS Cultural Education Center.